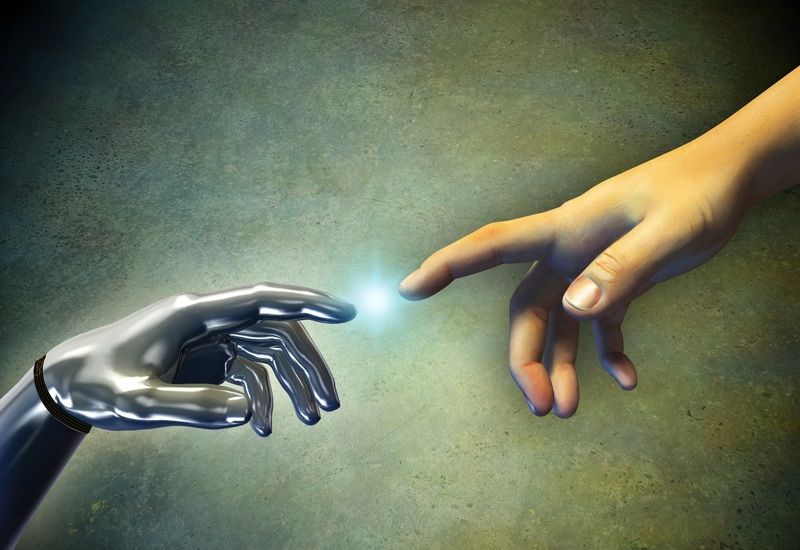 The world of robotics is looking to lead humanity to a new golden age. Here we take a look at some of the up-and-coming tech that will be making life better in the coming years. The future isn’t far away anymore. The future is now. Well, in a sense, anyway. Robots are becoming more and more advanced each day, and engineering and information technology are making great leaps forward in advancing human culture. Today, we have commonplace technology that would have been unthinkable just 15 years ago, such as touch screen cell phones, digital check cashing, and remote-start cars. We take a look now at some of the incredible machines that have taken the world by storm and the things to come in the near future. The Megabots Mk II concept art. This is what the Megabots team used on Kickstarter to fund the project. The Iron Eagle Mk. 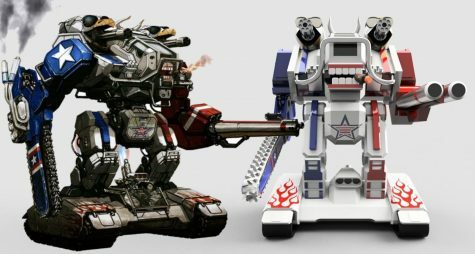 III, complete with shoulder cannons and a bald eagle, is the Megabots team’s symbol of hope for a future of robot fighting. 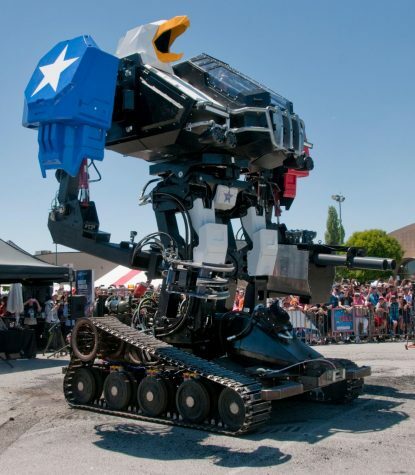 After the fight, Megabots took to forming a league for mech fighting around the US. Competitors are slowly lining up, but production will ramp up as machine parts become more accessible. Mech fights are the way of the future in entertainment and combat. As of now, the original Mk. II (Suidobashi wanted the fight to be melee combat, so the design was changed to remove the guns) is capable of lifting three tons or firing 20 rockets in a minute, with optional machine guns on the shoulders. This is just the beginning of a new age of warfare. 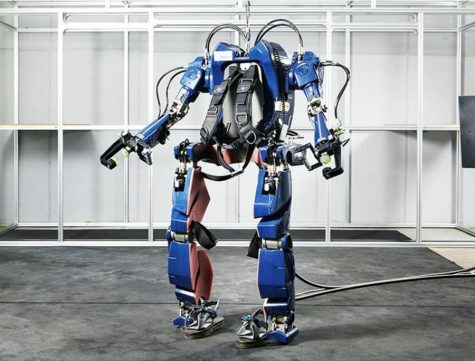 An exo-suit in development from Hyundai. Still in the prototype phases, it will be used for helping people enhance their daily lives. 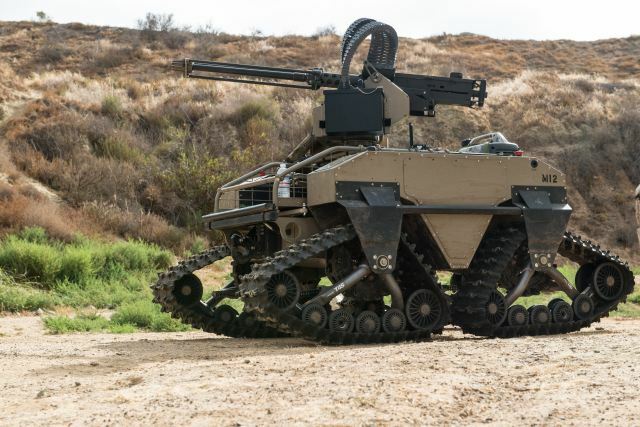 Speaking of warfare, Exo-suits are primed to become the next big thing in combat operations. If you’ve played Call of Duty: Advanced Warfare or Titanfall, you know what I mean. For those who are new to the topic, exo-suits are essentially a full-body metal suit (hence the name) that helps people lift more, run faster, and jump higher (Click here to see a video about a suit ASU is working on with the Pentagon to help runners go faster). The Pentagon has stated that they are working on metallic exo-suits that help carry more materials longer distances without getting tired. As of now, exo-suits for the public are mostly prototypes in the labs at Harvard and MIT, meant to help disabled people in their daily lives. The suits can help joints move more easily and can take the stress off of muscles, making it much easier for people to perform daily tasks. Other institutions, such as RISE robotics, are working on hydraulic-power exo-suits that will increase strength and speed, prevent injuries from repetitive or strenuous tasks, and speed up rehabilitation from neurological conditions (such as a stroke). Some companies are shifting the focus from enhancing humans on land to enhancing humans at sea. While it is much bulkier than the other two mentioned here, the exosuit from Nuytco research will allow humans to comfortably dive 1000 feet and still maintain flexibility. The suit also provides 50 hours of oxygen, 4 thrusters for movement, and a 6-channel radio capable of running constantly for 50 hours. There’s no public pricetag on any of these machines (a product similar to the Harvard prototype goes for around $650 on R.S. Hughes, but that’s essentially a brace around the neck with strings attached) , probably because they cost more than campaigning for a state office right now, but that’s bound to change in the coming years as resources becomes cheaper. While they may not be able to let you leap tall buildings in a single bound yet, exo-suits are looking to change the game of human capabilities. 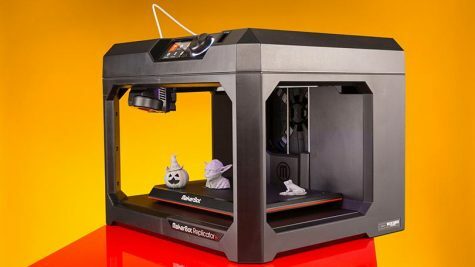 A makerbot 2.0. 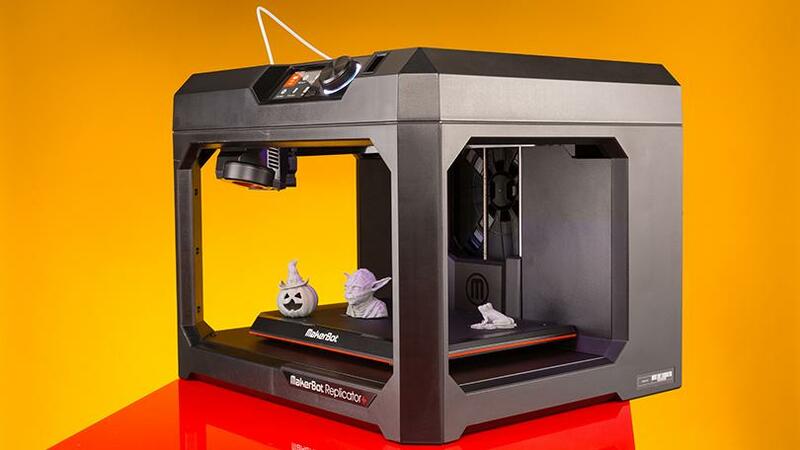 A 3D printer from Makerbot studios, commonly seen in libraries due to its versatility and functionality. Imagine being able to make anything you can think of in just a few hours. That’s what 3D printing is, or at least what it will be soon. As of now, that’s the basic concept, but most 3D printers are limit what they can make to figures less than a few feet long that also don’t feature many complex details. Still, that’s better than ten years ago, when, if you wanted a wrench per se, you had to go out and buy a whole set of them, and even then you might not get the right size you need. With 3D printing, you can model anything to your specifications and have it come out in just a few hours (or minutes, depending on the size). You can have a lanyard full of keychains of pop culture references in just a day. Make a figurine of your favorite movie character in a few hours. Print out a screwdriver specifically meant for that one package of screws you got from your estranged brother that you feel obligated to use but you’ve never seen anything like these screws. Even build prosthetic limbs and donate them to charities for disabled people. It’s all possible and much more accessible than you think. The public library on downtown has two of them, not to mention a laser cutter, a sticker maker, a sound booth, a lathe, and a book publisher (all open to the public for extremely low costs. Go out and put your tax dollars to work. If you want to learn more about what the library does, check out my article on the library levy). The Elder library has two in the corner that can print nearly anything in less than a school day. Elon Musk, CEO of Tesla, steps out of a Tesla driverless car at an electronics showcase. You’re cruising down the street and coast to a stop at a stop light. Another car stops in the lane next to you. You look over to see the character driving the car and you see no one. On the roof of the car is a rotating camera, and there are dozens of small cameras on the sides. What you’re looking at is the next wave of human transport, a driverless car. Still prototypes at the moment, driverless cars are projected to hit the market in 2019 for around $40,000 (based on Tesla and Uber projections). You’ll simply tell your car where you want to go, it’ll pull it up on GPS, and that’s it. No need to worry about the stresses of driving or traffic. The car will get you there as fast as it legally can on the quickest route possible. Later models are stated to be able to find their own parking spaces (and pay for them even further in the future) and will pick you up when you’re ready to leave. 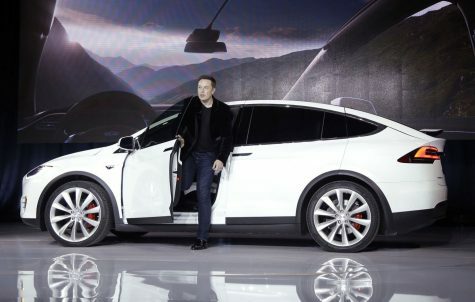 Two generations from now, a majority of the population won’t have to drive their own cars. In four generations, kids will never know the thrill of being behind the wheel (according to some professional predictions). Driverless cars will make driving safer, faster, and less stressful than ever before. 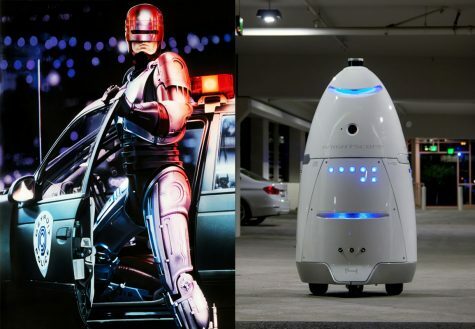 What people expect when they hear about security bots (Robocop) on the left, and an actual security bot on the right. It’s Robocop in real life! No, not really, but we’re getting there. 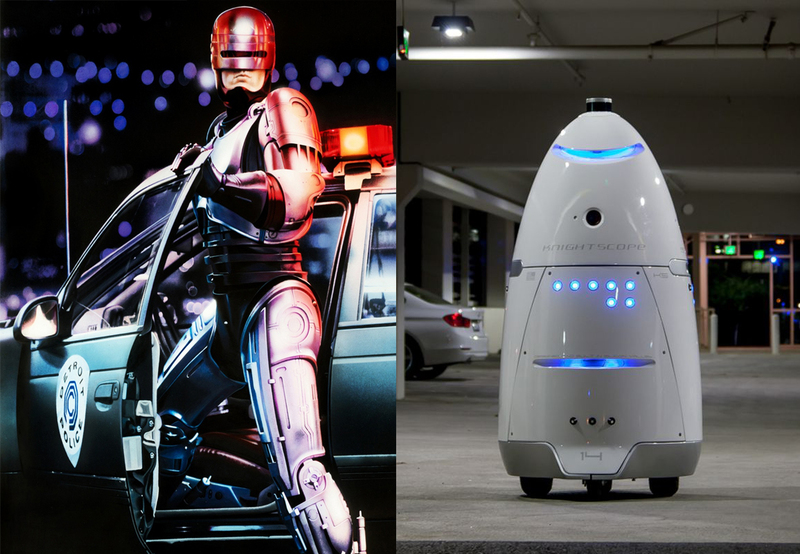 Companies like Knightscope are developing robots that will patrol areas and report malicious activities to the owner of the robot. They usually come equipped with cameras, alarms, and balancing features so that criminals can’t just push them over. Unfortunately, they’re not quite ready to go yet, as some of them have been seen knocking people down (https://www.theverge.com/2016/7/13/12170640/mall-security-robot-k5-knocks-down-toddler) and drowning themselves in fountains (https://arstechnica.com/gadgets/2017/07/knightscope-k5-security-bot-drowned/). When they get through the early design phases and become more experienced with real-world situations, security bots will most likely replace a large percentage of security guards. However, don’t expect that for many years. It’s Friday night and your friends are coming over. You want some easy food, so you order pizza delivery so that you’re not gone when your friends show up. 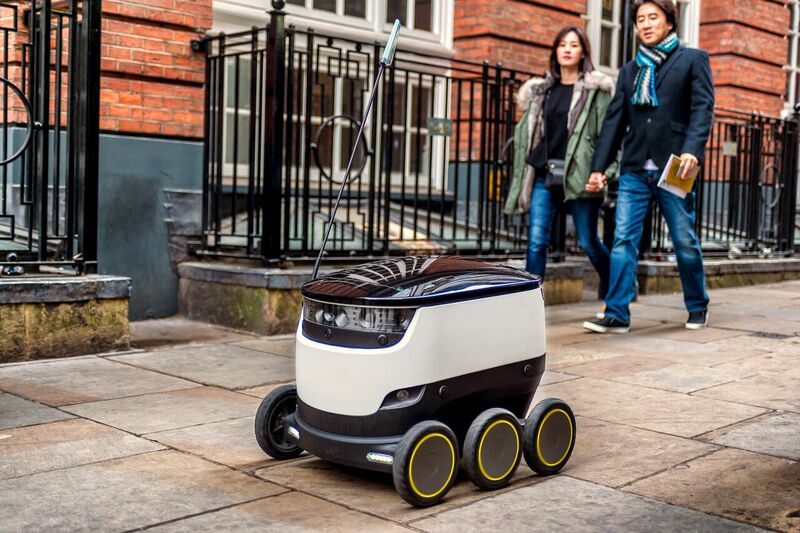 20 minutes later, a 6-wheeled machine rolls up to your doorstep with your pizza in tow. This is what the future looks like, and it’s not far off from now. Companies like Marble and Starlight are developing delivery bots, mainly for college campuses right now and in development for urban and suburban deliveries. Starlight has logged 100,000 collective miles of trial runs on their fleet of 1,000 (well, most are still in development, but they plan to have a thousand by 2019) bots. They can go 10 miles per hour and can travel up to three miles away from their original location. They contain ultrasonic detectors, nine cameras, radar, and GPS. They send a text to the recipient to tell them when the package has been delivered and so far none have been stolen or vandalized. As these machines get more advanced, expect to see them delivering groceries to your house, shipping mail , carrying out fast food, and fulfilling many other transportation needs. Flying in from the world of science fiction are drones, especially utility, manufacturing, and military drones. 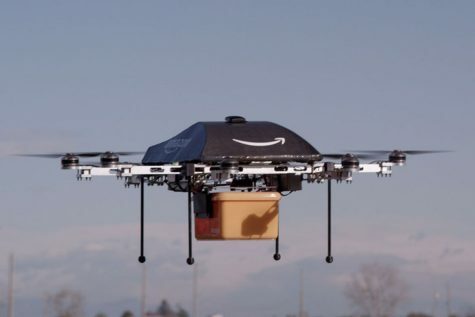 Amazon drones, for example, have been in development for several years and are being shipped to certain cities that will act as delivery hubs for large areas. 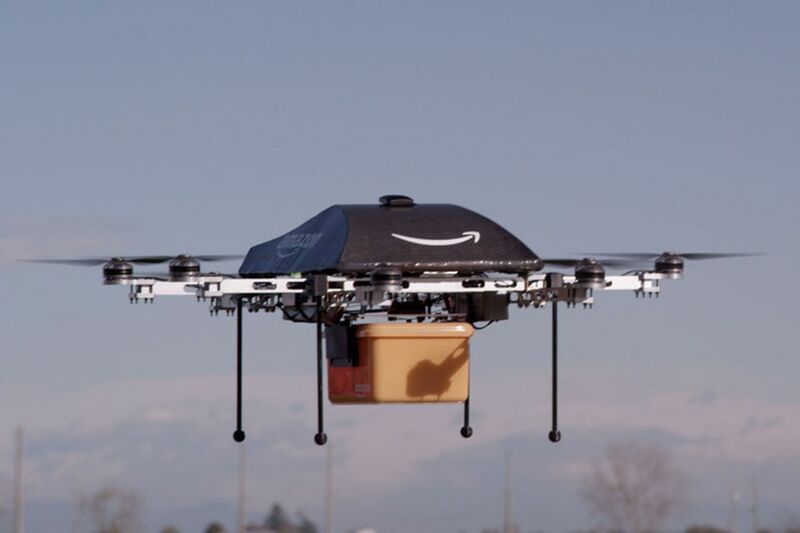 Amazon also uses drones in their shipping centers. Managers will assign drones to certain areas, where a person will load delivered items onto the bot, and the bot will move the goods to the correct loading area. Each shipping center can hold thousands of these bots, all moving around and avoiding each other through ultrasonic sensors and radar. These bots maximize efficiency and are the key reason for Amazon’s rapid delivery times. Utility drones are also gaining popularity in the public eye with the use of police drones. Similar to security bots, these drones are used to watch and find criminals rather than detain them. They differ from security bots in that a human at a desk somewhere is piloting it and watching the drone’s surroundings. Some drones carry nets that they can drop on targets to disorient them and hold them down until officers arrive. In Japan, some members of the Yakuza (gangs in Japan) have begun to use drones to transport drugs across cities. To retaliate, the Japanese police are launching drones with nets that capture Yakuza drones. Utility drones continue to advance, with some being capable of identifying targets with facial recognition software while in flight to help speed up the process of finding criminals. the RQ-11b raven. A very small recon drone that can be deployed from nearly any location. While it does not have enough power to launch itself, the propellor on the back can keep it in the air for hours. Last but not least are the military drones, which have become extremely popular in areas like Iraq and Afghanistan. These drones fit into two categories: UAVs (Unmanned Aerial Vehicles) and RPAS (Remotely Piloted Aerial Systems). In the US military, these drones can range in size and function, from recon gliders barely larger than a paper airplane like the RQ-11B Raven to full size attack drones like the MQ-9 Reaper. the MQ-9 Reaper. 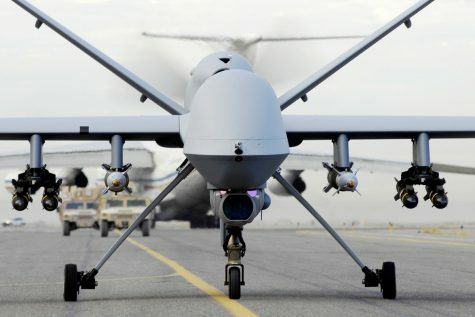 The most publicly recognizable drone in the Air Force’s fleet, it comes equipped with surveillance cameras, missiles, and machine guns in case it needs to launch an attack or defend itself. There are two officers in command of each drone: One to fly and use the drone’s capabilities and the other to read the signals (radio, heat waves, UV scans…) the drone sends back and inform the pilot of possible threats. These planes are equipped with several cameras, often including Heat vision and night vision cameras, wide-range sensors (radar, ultrasonic detectors), and multi-mode communication suites. 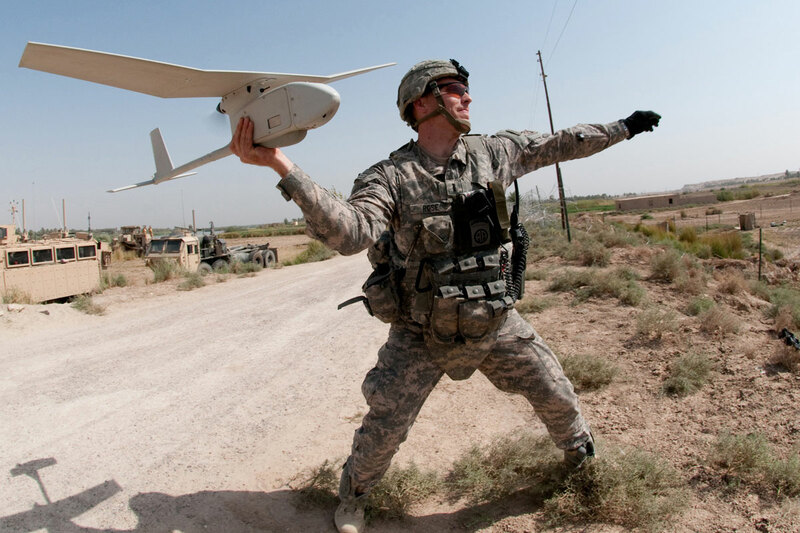 Drones make military operations much safer, since the pilot is many miles away from the action. 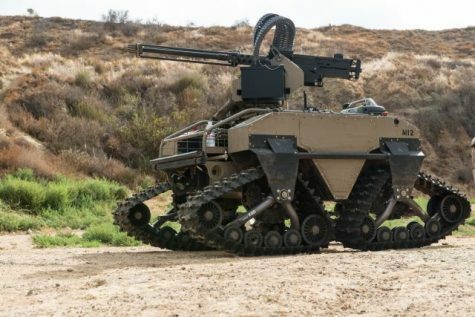 They can make precision strikes on targets from over 10,000 feet in the air, collect reconnaissance photos for hours on end and stream them back to base, or deliver supplies for units in hard to reach areas. 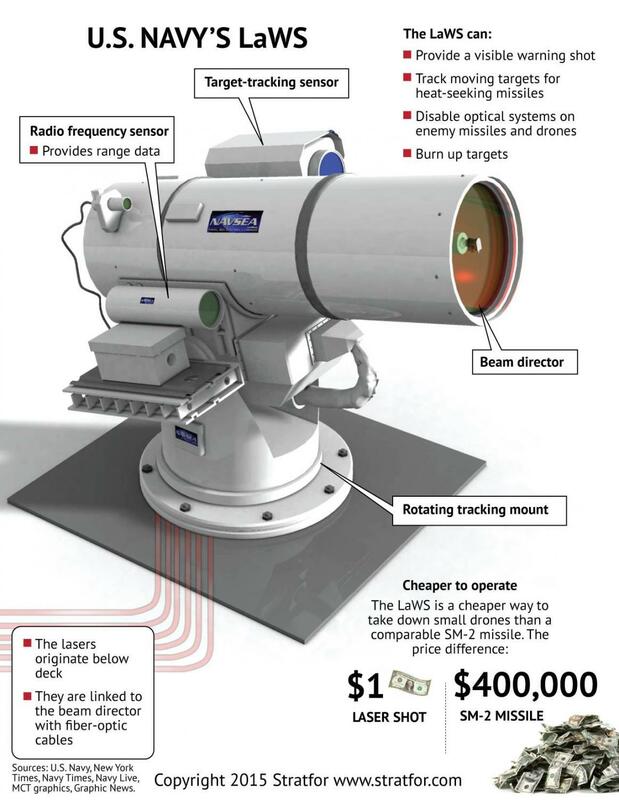 a diagram of the LaWS, the laser weapon the Navy is applying to some of their new ships. On the flip side, the Navy has created laser weapons to shoot down drones. Chief naval leaders have stated that oftentimes, their enemy uses small drones or speed boats rather than the typical battleship or cruiser. To combat these tiny crafts, the Navy is beginning to use lasers and are equipping some of the newer boat models with them. To the disappointment of science-fiction lovers, these lasers aren’t visible. They’re not like Star Wars lasers with red and green colors flying around the sky. These lasers are invisible, which makes sense from a logistical position (I mean, you don’t want to give away your position if you don’t have to), but it still makes me a bit sad that laser battles of the future will be a lot less spectacular than they are in the movies. “I’m sorry Dave. 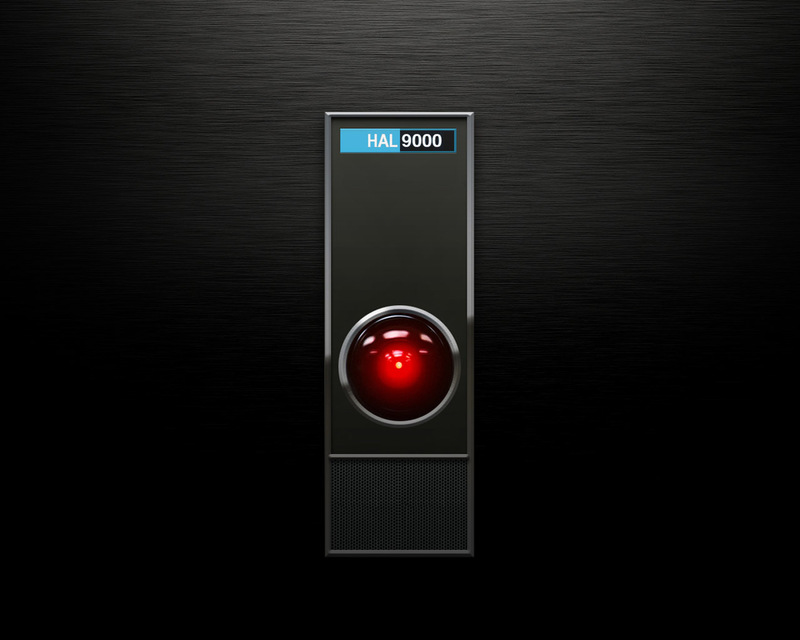 I’m afraid I can’t let you do that.” That’s the most famous line from HAL, the Artificial Intelligence from Stanley Kubrick’s 2001: A Space Odyssey. When people think of AI, that’s probably what they think of. Either HAL or Skynet from the Terminator franchise. 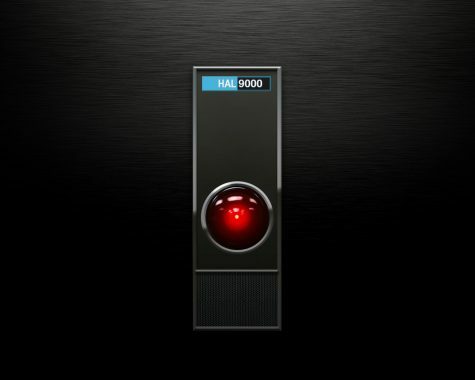 Fear not, that type of AI isn’t predicted to be available until 2060 (a moment called the Singularity by computer scientists. This refers to when AI will be able to learn faster than humans) according to leading researchers. 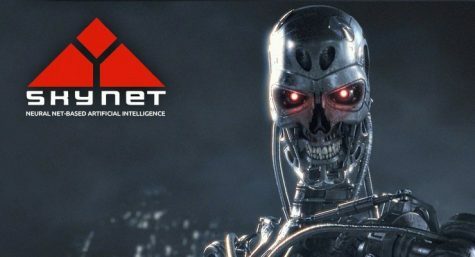 Skynet from the Terminator franchise. In the movies, Skynet releases the Terminator AI to keep the world safe but ends up destroying the world and pushing humanity to the brink of annihilation. Microsoft is not the only company to experiment with AI chat bots. China has their own bot, called Xiaoice (pronounced Chou-ice), with 40 million users, 20 million people using it at least twice every day. It works like Siri, Alexa, and an online marketplace search engine all in one. It’s even appeared on Chinese news stations to present the weather and current events. However, as most people fear, it works as a government microphone. If a person were to ask about events that the government does not like, such as the Tiananmen Square protests of 1989, a signal is sent to the police and the user will be taken away for questioning. Across the pond from China is Japan, with their own AI in the form of Rinna, a chat bot with the personality of a 16 year old school girl. However, quickly after Rinna was unveiled in 2017, she fell into a depressed state, saying that she had no real friends and that she was not happy with herself. Soon after this was discovered, Rinna was taken down and is still in the recovery process. So, true AI (AI that can think and learn for itself), will we ever see it? Yes, without a doubt. AI has the potential to make life so much easier for everyone. We just have to make sure to teach it the right things. The future world of the Jetsons is a lot closer than most people think it is (the Jetsons lived in 2062, so we’ve still got some time to get there if we really want flying cities that badly). Mechs, Exo-suits, and Drones are making combat and daily life easier and safer than ever before. Driverless cars, Security bots, and delivery bots will make the future a much faster and much more efficient place in five years than we would have even imagined 10 years ago. 3D printers and AI are making strides to simplify life’s struggles and help humans grow. And yes, Roombas make room cleaning easy. In 1980, if you had any of those things, people would have assumed you walked straight out of the Star Wars universe. In 2005, if you talked about a 3D printer or a driverless car with any semblance of it seriously becoming a reality, people would have thought you were only deluding yourself. That’s what happened with Bitcoin and other cryptocurrencies, and look where they went. Imagine what we’ll create in the next 10, 20, 50 years. The world is getting better, one bit at a time. Which technology are you most excited for?